Resis'Dance rooftop party is coming up on the 24TH September! Resis'Dance collective will be setting up the tech and bringing some r&b, hip-hop, garage, house, dancehall, soca vibes. Our nights also support some of the most important groups fighting for justice who struggle to get funding. All money raised this time round will be heading to LAWA (Latin American Women's Aid) and for the Resis'dance Collective to buy DJ equipment so we can keep running our DJ workshops, provide support for women who wish to continue to practice and learn, and for us all to get even more tight on the decks so our nights keep getting slicker and slicker. Come and connect with other women in music. Get inspired, make connections, and share skills. We'd like to invite the women who participated for our DJ workshops in August, but also women who are interested in smashing the patriarchy. Resis'dance aims to create an opportunity where marginalised groups; Black Minority Ethnic, Trans, Intersex, Non-binary identifying people - can learn and have opportunity to infiltrate the male, normative, white, patriarchal club scene, so if you're into that, come down! There will be women from all over the industry - DJs, muscians, singers/songwriters, music journalists, PR and management, and radio dropping by. We'll also have equipment out for you to practise and ask questions. 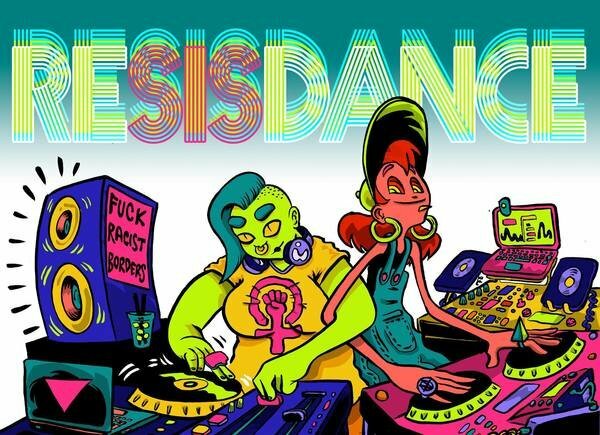 Resis'dance aims to showcase a a variety of talent, focusing primarily on women, trans, intersex & non-binary DJs & Performers. R&B, Hip-Hop, Garage, UK Bass, Dancehall, Soca, Bashment, House, 4x4. With great displeasure we must announce that the night is not fully wheelchair accessible. There is a lift that goes to the third floor and then there is 10-12 steps to hit the dancefloor. We are looking to see if a ramp would be too steep, otherwise our female militia will be on hand to help. So please still come down and we will get you there! Toilets on the ground floor are accessible but there are none on the dance space we apologise for this. Please get in touch if we can make the night more accessible for you. Feminist Militia will be trained and ready to help anyone with accessibility. Resis'dance are working on ramping up the stairs to get to the roof and make it available for everyone. £3 unwaged, £5 waged, £7 solidarity. Tickets realeased soon. LAWA is a dedicated specialist service led by and for Black and Minority Ethnic (BME) women, working together to end violence and enhance empowerment. They run the only refuge for Latin American women, and offer a lifeline to those fleeing domestic violence. They are a feminist organisation that stands united in solidarity and sisterhood with those facing violence, oppression and discrimination in any form.